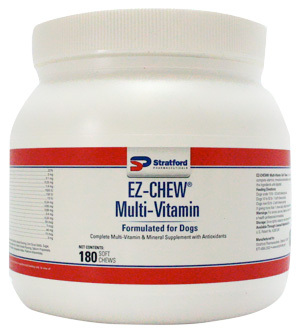 EZ-CHEW Multi-Vitamin for Dogs are an ideal supplement to promote overall wellness and health for your dog. This multi-vitamin offers a wide array of nutrients including a carefully selected blend of vitamins, minerals, and antioxidants that ensure that your dog stays healthy. The nutrients range from iron and copper to Vitamin B12 and Folic Acid to ensure that your dog has everything needed to maintain health in a variety of systems, including digestive, circulatory and immune. These mutli-vitamins come in the form of highly palatable soft chews that makes feeding them to your pets as easy as possible. This bottle of multi-vitamins comes with 180 soft chews but there is also a bottle with 60 soft chews available. These chews are easy to use and contain everything your dog needs to maintain overall health, so order them for your dog today! Ingredients: Corn Starch, Filtered Water, Sorbitol, Glycerin, Canola Oil, Pork Liver Powder, Cheese Powder, Rice Bran, Natural Flavoring, Corn Syrup Solids, Sugar, Natural Bacon Flavoring, dl-Alpha Tocopheryl Acetate, Choline Chloride, Absorbic Acid, Caramel Coloring, Sorbic Acid, Hickory Smoke Flavoring, Calcium Propionate, Niacin,Iron Hydrochloride, Copper Acetate, Folic Acid, Biotin, Vitamin B12, Vitamin D3, Vitamin A. Storage: Store tightly closed at room temperature to ensure freshness, in a cool dry place.